Draft: 2011, San Francisco Giants, 12th rd. Married to Tiffany…has 2 sons, Huck and LeRoy...Signed by D-backs as a Minor League free agent (Nov. 20, 2018)...Grew up in Elgin, Okla., a small rural town near Fort Sill Army base which opened in 1869 and declared a National Historic Landmark in 1960… Geronimo, the Apache leader, is bur- PERSONAL ied at Fort Sill. Appeared in 63 games over 6 stints with the Giants, batting .207 with 4 doubles, 2 triples and 10 RBI...Played in 35 games at second base, 13 at shortstop and 3 at third base..Made his second career Opening Day roster (also: 2016)...Batted .304 (55-for-181) with 2 doubles and 10 RBI in 48 games for Triple-A Sacramento…also played 2 games Single-A Adv. San Jose. Hit .258 (50-for-194) with nine stolen bases in 104 games with the Giants...Recalled two separate times...Made 38 starts (17 at second base, 11 at third base, eight at shortstop and two in left field)...Hit his third career home run on Sept. 12 off Dodgers' LHP Clayton Kershaw...was 0-for-14 with six strikeouts against Kershaw entering the at-bat...Hit .296 in 26 games at triple-A. Batted .292 (31-for-106) with four doubles and six RBI in 52 games with San Francisco. Started 24 games for the Giants (17 at second base, four at shortstop, one at third and two in left field). Was 7-for-17 (.412) with two doubles and two RBI as a pinch-hitter. Missed 29 games with a left thumb sprain from June 10-July 14 and was optioned to triple-A when he was activated. Hit .286 (53-for-185) in 49 games with triple-A Sacramento. Started in left field for the first time in his career on May 21 vs. Chicago-NL…was put in left because Angel Pagan and Hunter Pence were dealing with sore hamstrings. In just his second career game in the outfield he registered his first career assist on May 25 vs. San Diego, throwing out Yangervis Solarte at home in the second inning. Hit .303 (54-for-178) with 23 runs scored and a .358 on-base pct. in 54 games for the Giants in his first ML season....Had his contract purchased from triple-A Sacramento Aug. 3, replacing Joe Panik, who had been placed on the 15-day disabled list with lower back inflammation....Made four errors in 216 total chances in 46 games at second-base....Hit .371 (23-for-62) and posted a .913 OPS against the left-handed pitching....Collected his first big league hit Aug. 3 at Atlanta off LHP Ross Detwiler, a one-out single in the 12th inning, and then scored the go-ahead run on Buster Posey's two-out single....Received his first big league start on Aug. 5 at Atlanta, starting at second base and going 2-for-4 with three RBI....According to Elias, the only other second basemen with at least three RBI in either their first or second game with the Giants were Rogers Hornsby and Jeff Kent....Started his career with three hits in his first three at-bats, becoming the first Giants player to accomplish that since Fred Lewis was 3-for-3 to start his career in 2006....His first career home run was a grand slam Aug. 27 vs. Chicago-NL off LHP James Russell in the 8th inning…became the 15th player in Giants history (sixth in SF-era) to hit a grand slam for his first big league home run....Recorded his first career game-ending hit Aug. 28 vs. Chicago-NL, hitting a single with the bases loaded off LHP Kevin Siegrist with one out in the 9th inning to give the Giants a 5-4 win....Hit the ninth inside-the-park home run in AT&T Park history on Oct. 3 vs. Colorado (off LHP Chris Rusin)....Combined to hit .321 (125-for-389) in 97 games with double-A Richmond and triple-A Sacramento prior to his call-up. Spent the entire campaign with double-A Richmond, batting .268 with 63 runs scored, 49 stolen bases and a .340 on-base percentage in 126 games...his 49 stolen bases led the Eastern League and were the most in the Giants' organization. Missed over two months on the disabled list during two separate stints with a right foot contusion and a left quad strain. Led the AZL-Giants with 11 stolen bases. November 26, 2018 Arizona Diamondbacks signed free agent SS Kelby Tomlinson to a minor league contract and invited him to spring training. November 26, 2018 SS Kelby Tomlinson assigned to Reno Aces. 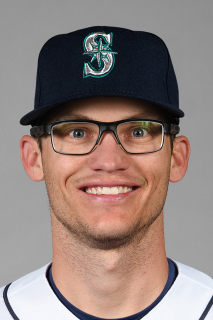 November 2, 2018 SS Kelby Tomlinson elected free agency. October 22, 2018 San Francisco Giants sent SS Kelby Tomlinson outright to Sacramento River Cats. September 2, 2018 San Francisco Giants recalled SS Kelby Tomlinson from Sacramento River Cats. August 4, 2018 San Francisco Giants optioned SS Kelby Tomlinson to Sacramento River Cats. July 30, 2018 San Francisco Giants recalled Kelby Tomlinson from Sacramento River Cats. July 26, 2018 San Francisco Giants optioned 2B Kelby Tomlinson to Sacramento River Cats. July 15, 2018 San Francisco Giants recalled Kelby Tomlinson from Sacramento River Cats. July 5, 2018 San Francisco Giants optioned 2B Kelby Tomlinson to Sacramento River Cats. July 4, 2018 San Francisco Giants recalled Kelby Tomlinson from Sacramento River Cats. June 21, 2018 San Francisco Giants optioned 2B Kelby Tomlinson to Sacramento River Cats. June 18, 2018 San Francisco Giants recalled Kelby Tomlinson from Sacramento River Cats. June 5, 2018 2B Kelby Tomlinson assigned to Sacramento River Cats from San Jose Giants. June 2, 2018 2B Kelby Tomlinson assigned to San Jose Giants from Sacramento River Cats. June 1, 2018 San Francisco Giants optioned 2B Kelby Tomlinson to Sacramento River Cats. May 30, 2017 San Francisco Giants recalled Kelby Tomlinson from Sacramento River Cats. May 17, 2017 San Francisco Giants optioned 2B Kelby Tomlinson to Sacramento River Cats. April 26, 2017 San Francisco Giants recalled Kelby Tomlinson from Sacramento River Cats. April 1, 2017 San Francisco Giants optioned 2B Kelby Tomlinson to Sacramento River Cats. September 1, 2016 San Francisco Giants recalled Kelby Tomlinson from Sacramento River Cats. July 11, 2016 San Francisco Giants optioned SS Kelby Tomlinson to Sacramento River Cats. July 11, 2016 San Francisco Giants activated 2B Kelby Tomlinson from the 15-day disabled list. July 4, 2016 San Francisco Giants sent 2B Kelby Tomlinson on a rehab assignment to Sacramento River Cats. July 2, 2016 San Francisco Giants sent 2B Kelby Tomlinson on a rehab assignment to San Jose Giants. June 10, 2016 Kelby Tomlinson roster status changed by San Francisco Giants. August 3, 2015 San Francisco Giants selected the contract of 2B Kelby Tomlinson from Sacramento River Cats. June 26, 2015 2B Kelby Tomlinson assigned to Sacramento River Cats from Richmond Flying Squirrels. February 2, 2015 San Francisco Giants invited non-roster 2B Kelby Tomlinson to spring training. October 3, 2014 2B Kelby Tomlinson assigned to Scottsdale Scorpions. March 9, 2014 SS Kelby Tomlinson assigned to San Francisco Giants. July 22, 2013 2B Kelby Tomlinson assigned to Richmond Flying Squirrels from San Jose Giants. June 28, 2013 Kelby Tomlinson roster status changed by San Jose Giants. June 20, 2013 San Jose Giants sent SS Kelby Tomlinson on a rehab assignment to AZL Giants. April 28, 2013 San Jose Giants placed SS Kelby Tomlinson on the 7-day disabled list. April 18, 2013 Kelby Tomlinson assigned to San Jose Giants. April 18, 2013 San Jose Giants activated SS Kelby Tomlinson from the 7-day disabled list. April 11, 2013 San Jose Giants placed SS Kelby Tomlinson on the 7-day disabled list retroactive to April 10, 2013. April 11, 2013 Kelby Tomlinson roster status changed by San Jose Giants. March 31, 2013 SS Kelby Tomlinson assigned to San Jose Giants from Augusta GreenJackets. March 20, 2013 SS Kelby Tomlinson assigned to San Francisco Giants. September 1, 2011 Kelby Tomlinson assigned to Augusta GreenJackets from AZL Giants. June 25, 2011 Kelby Tomlinson assigned to AZL Giants from San Francisco Giants. June 24, 2011 San Francisco Giants signed SS Kelby Tomlinson.